Is that Darryl from "the Office?" 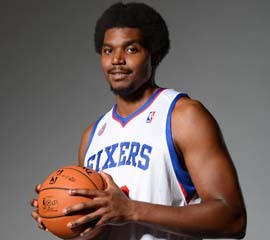 "Andrew Bynum practiced Friday with the Philadelphia 76ers for the first time since they traded for him last August. But instead of it being a positive moment, it only seemed to depress coach Doug Collins." "He looked like a guy who hadn't played in nine months." "It's amazing seeing him standing out there; he distorted the whole practice. You get visions of what might've been ... He's said that he's going to play, but this season is slipping away." "You should talk to him. I don't want to be the messenger because they shoot messengers." Wow. This blows my mind. Imagine Doc Rivers ever saying something like this about one of his players? Even if Doc felt that way he would never publicly say it; especially admitting that he has no control or involvement in when his guy is ready to play. What a mess they are in Philly right now.